I'm a cigar smoker. I've been smoking cigars since I was a very young man. I recall smoking a fine cigar when I was in my early 20s on the fantail of a U.S. Navy tugboat at the nuclear submarine base in Holy Loch, Scotland. Another young sailor approached me and asked, "Don't you feel old smoking a cigar?" "No," I replied. "I feel... prosperous." 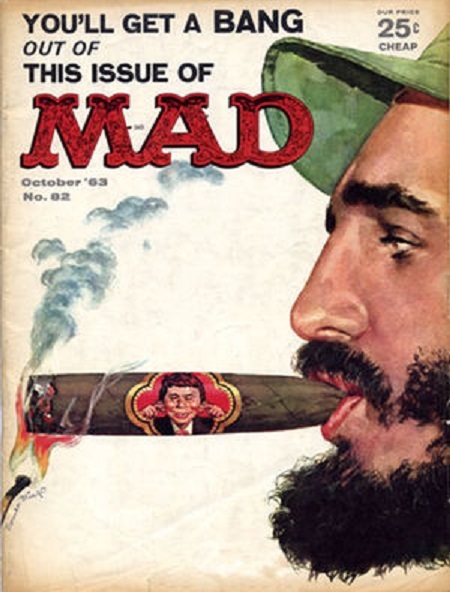 At a recent gathering of serious cigar smokers, I was bold enough to state that I thought Cuban cigars were overrated. I prefer a Dominican Republic Cohiba to a Cuban one. It seems to me that the Communist Cubans don't quite grasp the concept of quality assurance. I was surprised to discover that a good number of my fellow cigar aficionados felt the same. So I pleased to read that Christopher Sabatini offered a piece on five Cuban myths in the Washington Post, and he included Cuban cigars as one of the myths. Cuban health care and Che Guevara are two other myths Mr. Sabatini pokes holes in. President Obama’s historic trip to Cuba this past week returned U.S. and world attention to the small Caribbean island of 11 million people and the long, curious history between it and the United States. It’s hard to think of a similarly sized country that has had such a memorable, tumultuous, often romantic hold on U.S. history and imagination. That narrative encapsulates a welter of assumptions — some propagated by the 1959 revolution, others by the Cuban diaspora and the rest by Americans who haven’t seen Cuba up close in more than half a century. Here are some of those myths.